Condition: New product - Emergency food Rations Mainstay™ 3600 calories bars are specially formulated for land-based high stress situations. Each package contains 9 pre-measured 400 calorie meals, which allows a person to get their full nutrition in a challenging situation. Mainstay™ is Kosher and it meets the dictates for Halal. 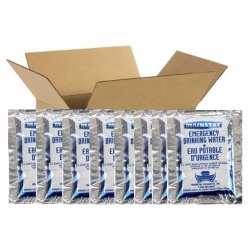 Condition: New product - Emergency food Rations Mainstay™ A case of 10 3600 calorie bars are specially formulated for land-based high stress situations. Each package contains 9 pre-measured 400 calorie meals, which allows a person to get their full nutrition in a challenging situation. Mainstay™ is Kosher and it meets the dictates for Halal. All water is not created equal! Here at Survivor Industries we have spent years perfecting our Mainstay™ Water Packets. The final result is a portable product with a shelf life untill 2019. Other Key Benefits: Coast Guard Approved No Oxygen Transfer (In other words, no chance of bacterial contamination) Pre-Measured Packets make the water easy to dispense, and potential for loss is minimized. If a packet is destroyed, only 4.224 ounces (125 ml) would be lost. Easy to Transport - just 18 lbs. (8.17 kg) per case of 60 packets. No special storage required - it can withstand temperatures from (-40°F to 210°F) (-40°C to 99°C). Very Low Cost. No Cups Needed! These water packets were designed for military survival kits and are Coast Guard approved. The pouches are made from mylar and can take a lot of abuse. We offer these packets of water in a case of 60 bags which works out to about 25 cents each. Each bag contains slightly more than 1/2 cup of water. This works out to about $7.50 per gallon. (5 1/2" x 4 1/4" x 1/2" thick) Contains 4.225 fl oz or 125ml drinking water. Canadian and United States Coast Guard Approval Number: 160.026/63/1 Easy To Use Anytime... Anywhere Consumption: Use 2 each 4.225 oz bags per person per day. Field Test: Check bag by squeezing. If air or water escape - replace. Recommended Life: Five years from date of manufacture. Key BenefitsLasts for 5 years after the March 2019 Shelf Life if unopened from the Vacuum PackNon-Thirst ProvokingWithstands Temperatures of -40 F to 300F (-40C to 149C)Ready to Eat: Each package contains 9 pre-measured 400 calorie meals.Individualized Portions eliminate the messy breaking-up that occurs with other barsAllows for on-land emergency consumption in a high-stress active situation.Contains no cholesterol or tropical oils.Meets the US Coast Guard standards (160.046/23/0). It's new modern packaging even meets the stringent guidelines set by the Department of Defense (SOLAS 74/83).Enriched with vitamins and minerals exceeding the RDA requirements.Pleasant lemon flavor which appeals to everyone.Mainstay™ is Kosher and it meets the dictates for Halal.